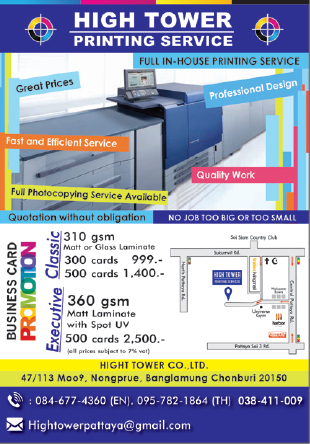 Honda Automobile (Thailand) Co., Ltd. has retained the No. 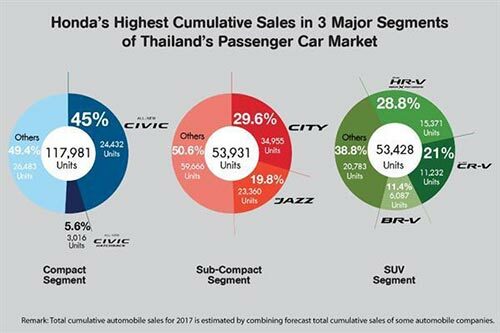 1 position in Thailand’s passenger car market for the third year in a row, with cumulative sales for 2017 of 127,768 units (including the Honda BR-V, HR-V, and CR-V) and captured a 32.2% market share. Honda also ranked in the No. 1 position for cumulative sales in three main market segments, which are sub-compact, compact, and SUV vehicles. The company is committed to moving forward to develop automobiles and services in return for a growing number of customers who put their trust in the Honda brand. Honda maintained the No. 1 position in passenger car sales last year, with cumulative sales of 127,768 units from January through December 2017, including the Honda BR-V, HR-V and CR-V, capturing a 32.2% share of Thailand’s passenger car market. Honda achieved the highest cumulative sales in three major passenger car market segments. In the sub-compact segment, Honda captured a 49.4% market share with cumulative sales of 58,315 units (Honda City 34,955 units and Honda Jazz 23,360 units); a 50.9% market share in the compact car segment with cumulative sales of 27,448 units (Honda Civic 24,432 units and Honda Civic Hatchback 3,016 units); and was especially strong in the SUV segment, capturing an overwhelming 61.2% market share with cumulative sales of 32,690 units (Honda HR-V 15,371 units, Honda CR-V 11,232 units, and Honda BR-V 6,087 units). Honda’s top five best-selling models in 2017 were the Honda City, Honda Civic, Honda Jazz, Honda HR-V, and Honda CR-V. In addition to achieving the highest sales in 2017, Honda received the Outstanding Brand Image for Trusted Brand award for the sixth consecutive year, from 2012 to 2017, from the Thailand Automotive Quality Awards (TAQA). “We would like to thank all our customers for their confidence and trust in Honda automobiles. We will continue to strive to expand the potential of our customers’ lives through our products and advanced driving technologies, meeting the daily needs of our customers’ various lifestyles, while enhancing service standards for the highest customer satisfaction. Honda will continue to fulfill the company’s vision of bringing joy to our customer’s lives and being a company that society wants to exist,” concluded Mr. Pitak. *Total cumulative passenger car sales from January to December 2017 is estimated at 399,000 units. This represents around 21% growth compared to 2016, which had sales of 328,053 units. Total sales for the entire Thai automobile market for 2017 is estimated at 870,000 units, around 13% higher than 2016, which had sales of 768,788 units.